Signed a petition today for the Officers who retired from State Bank of Travancore ( SBT ) hand pensions not being paid. My Dad is one of the officers. 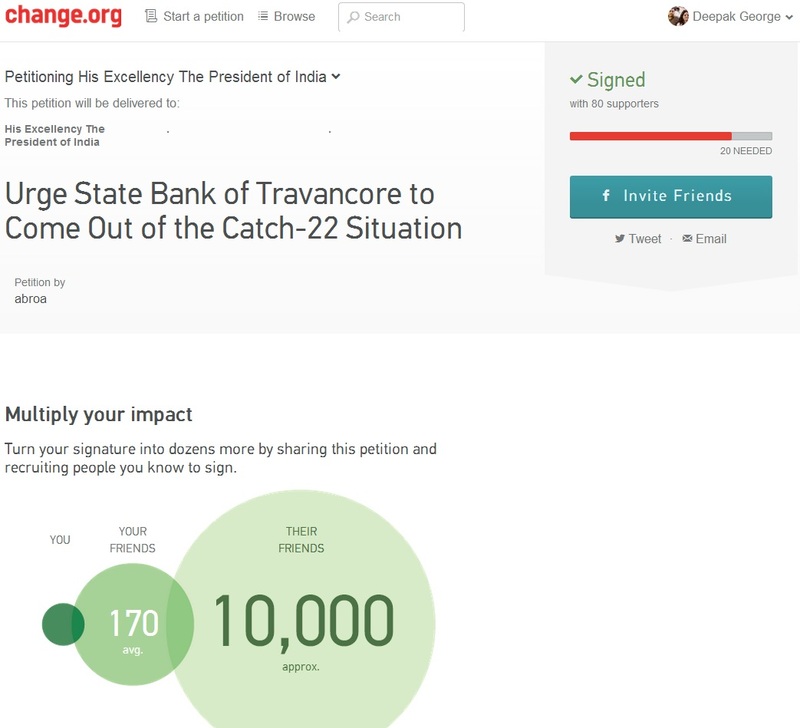 Urge State Bank of Travancore to Come out of the Catch-22 Situation11 retirees of State Bank of Travancore who had left the Bank’s service under Exit Scheme had filed a case in 2011 against the Bank because they were not extended the benefit of pension. The Board of Directors of the Bank decided in 2013 to extend pension to Exit Optees, but the executives are denying payment, claiming that the matter is sub judice. It is sub judice because the Bank had denied pension in the first place. Thus the Bank has created a Catch-22 situation – refusing pension resulting in litigation which is now cited as an excuse to refuse pension. The moment the Bank starts paying the pension, the raison d’etre of the case ceases to exist because the prayer of the officers in the court gets fulfilled and the relief claimed by them gets granted. Relying on a whimsical stand and taking law into its hands, this public sector bank is harassing 11 retired officers who had toiled hard for the Bank for over three decades. Look at it this way: the annual outlay on this would be below Rs 25 lakhs – a minuscule of the amount the Bank writes off as bad loans every year! Vicarious pleasure being derived from a cruel game, what else?